It’s the beginning of a new year, and so it’s time to reflect on what the past twelve months have brought us. A love that rocked your world, or one that stayed unanswered, sorrow you didn’t think you could overcome or joy you didn’t think you’d ever experience. Or maybe just life as usual. Whatever it may be in your life, it most likely also happened in one or more films that were released this year. 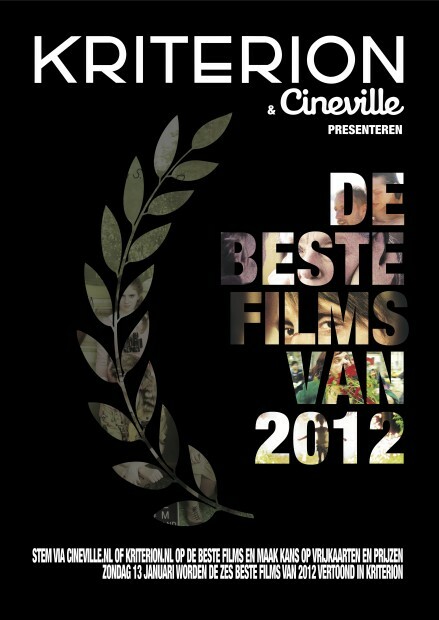 For the third year in a row, Kriterion and Cineville are hosting De Beste Films at which the top rated films of the past year will be shown on the big screen one more time. The Best Films of 2012 is part of Kriterion’s year-opening, celebrated fully in the weekend of January 11th-14th. On Friday, there’s a special sneak preview and opening get-together, followed by the Amsterdam-Reykjavik special on Saturday, with the indie hit documentary Grandma Lo-Fi (about a granny who decides to become a pop star at age 70), a free performance of Icelandic lo-fi duo and twins Pascal Pinon, an Icelandic buffet and a surprise film from Iceland. On Sunday, then, head back for The Best Films of 2012 to see your favourites from the top 8, which will be screened in four blocks from 1pm on. To give your eyes some rest after two movies, meals will be available around dinner time – as well as a free performance by The T.S. Eliot Appreciation Society, an up-and-coming Dutch singer-songwriter in the folk genre that reminds me of long-time favorite The Tallest Man On Earth. This intimate concert is the kick-off of a new monthly series of acoustic performances at Kriterion, Sessies op Zondag. To finish off the weekend, the official premiere of Belgian film Offline will take place on Monday with a visit of cast, crew and soundtrack composers Triggerfinger – known by all for their cover of Lykke Li’s I Follow Rivers. To put the cherry on top of this cake, we are giving away a gift package containing two marathon tickets (to see four films) and two dinner meals with a drink included! If you’re interested, check out our Facebook page and tell us from which films the five stills in the official Beste Films poster are by commenting below this article on our wall.